New service hits PS3, PS4 in 2015, other devices later on. Sony this morning took the wraps off of PlayStation Vue, a new cloud-based television service coming to the PS4 early next year. Vue is designed to take on the likes of Hulu Plus, offering on demand TV programming for a monthly, contract-free fee (exact pricing is TBA). Sony's far reach in the TV and movie businesses mean the company has already locked up deals with a number of networks and conglomerates, including CBS, Discovery, FOX, NBC, Scripps (Travel Channel, Food Network, etc. ), and Viacom (Comedy Central, MTV, etc.). The deals with CBS, FOX, and NBC include the network's entire lineups, so CBS Sports, NBC Sports, and others. Movies are also a big component of Vue -- presumably a library from Sony and the aforementioned partners -- and the film selection appears to be lumped in with the same monthly fee. Watching and saving content relies on Sony's cloud servers, but you'll be able to customize your viewing experience. Once you add a show to your favorites list, its episodes can be saved for up to 28 days in the unlimited cloud storage at your disposal. You'll also be able to watch any and all content from the previous 72 hours with the need for recording (handy for catching up on The Daily Show, I suspect). There's yet to be confirmation of offline content viewing, so it's cloud or bust until Sony says otherwise. PlayStation Vue will go wide during the first quarter of 2015, but a limited closed beta will push out to select PS4 and PS3 users later this month. 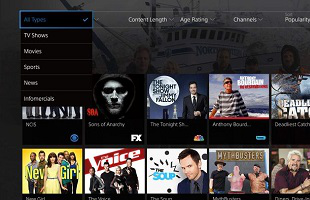 The first non-Sony devices to get PlayStation Vue? Apple's iPad family, with the service hitting iOS "shortly" after the PS3/4 launch. I remember reading a bunch of articles last month talking about how Sony was ahead in the "console war" race so they weren't trying to improve anything, while Microsoft was putting out a bunch of good games to be more competitive. Apparently Sony has decided to try and beat them at their own game and offer more multimedia services. I'll be interested to see if this works out, or just crash and burn. My question is whether we have to sit through commercials. I don't mind streaming on hulu but I really wish I could see shows without commercials when I pay a subscription fees. If Sony's new product is the same I'll pass. I can't even watch movies on hulu cause I get so pissed watching the same bloody ad 8 to 10 times. Little hint guys. I have never bought a product from a hulu commercial. Not once. You damage your brand cramming the same ad into my face constantly. get some variety or better yet get a business model based on getting me what I want to pay for. Any live sports? Aka, the only reason I still have cable...? The partners they signed up (FOX, CBS, NBC, ABC) certainly broadcast enough live sporting events, but it's unclear if that will carry over to Vue. If they are able to do sporting events and ad free series streaming, I'll look into it. If not, what's the point really. Oh great, more cloud crap. I don't know how Hulu plus works, but this seems to be DVR for the cable cutters. That second to last paragraph implies that they delete any unsaved shows 72 hours after they are uploaded and up to 31 days later, if a user "recorded" it. Correct me if I'm wrong here, but that's the gist I get of it, and maybe the terms will be clearer when the service is launched. I would like to know pricing and if PS+ users get a discount. I don't really give a microfuck about anything on TV today (except MythBusters, Archer, and The Venture Bros), but if the new release movie selection is good and this is uber-cheap I might go with this instead of giving in to Amazon Prime or waiting the ten millennia for a movie to be on Netflix. I don't know what's going on lately with PS4. My boyfriend, our roommate and I all have 3 different 360s with Live. We recently bought 3 PS4s, after seeing years of exclusives come out for PS3 that I wanted, and not giving a damn about the exclusives for the 360 I had. I've enjoyed it well enough so far, but they seem to really fail at the streaming department. It seems like every time we try to watch Hulu or Netflix, it keeps stalling and freezing, often refusing to load past '97%'. It's unbelievably frustrating, and we end up having to just shut it off and start up a 360 to keep watching whatever kept freezing. It never happens on our old machines. Yes, we've called Comcast, and they've gone through (at length) and opened / assigned ports to optimize gaming and such. Is it a server issue? I know nothing about computers & the internet, but the severe streaming performance discrepancy between the two just doesn't make sense to me. Between that and not being able to watch YouTube (am I just missing an app somewhere? ), they've been kind of a let down so far. Am I the only one that's not interested in streaming services? I prefer pulling the disc out and putting it on regardless of it the net is on or if the publisher decided to pull it from service. You're not alone. I might support net neutrality and streaming video (mostly Youtube, actually), but if there was still a physical DVD rental place near my house (Red Box can stick it. ), I'd frequent that to rent new and old movies and maybe games. I also prefer buying physical media for movies and console games, when they can be found on discs/carts. And, after Steam and Rockstar's recent GTA: San Andreas stunt, I'm also weary about downloading big, expensive AAA releases on PC services, without a disc to rollback to before some dirty patches, too. Like vinyl records, there will always be a market for us in the foreseeable future, contrary to the wishes of power hungry corporate shills. Like I stated in my post above, PS Vue really only sounds good if it's super cheap and as a way to rent newly released movies and watch TV shows, if you can't get or missed them. It probably won't be the big attraction Sony and some publications I read are hoping it will be. Unfortunately there are a lot of people who don't care, they want the latest game and anything beforehand they don't care about. Thus the play then buy next years edition players don't care if it stops working afterwards. I just hope we have a high enough percent of the audience to matter. Lemme guess... North America only?